The Corrugate Jacket is a four-way stretch, brush busting jacket constructed from the same lightweight material as our Corrugate Guide Pants. From kicking down farm windrows for pheasant to pushing through thorny swamps while tracking blacktail, this jacket is the mack truck of lightweight outerwear. Durable, lightweight nylon protects skin and base layers from whatever your hunt throws at you while reducing wind chill. Our trademark shooters cut and four-way stretch material never inhibit the mobility or your ability to draw a bow or raise a shotgun. I was worried I would not really use a lightweight jacket very often and have found that I really love using it during early deer and turkey season. The material and design are great! Good job FL. Purchased this Jacket to match the pants I had already bought. With layering, the jacket worked perfectly in the early October Bow Hunt I enjoyed in Michigan during 2018. The Season was tough, but my clothing was comfortable during Tree Stand sits and Ground Blind hunts. I love the flexibility this clothing offers, makes for a comfortable day hunting. Highly Recommend. The fit is very comfortable, with ease of motion. Not Bulky or Restrictive to movements while in Tree Stand or Ground Blind. Great clothing for making Bow Draw easy. Just bought this jacket for leisure and I love it. Great fit and feel I will definitely buy a camo one for hunting. This is my first firstlite purchase and if this jacket is any indication of how well their products are made and perform then I can’t wait to buy my whole hunting system through them. Wore this jacket this last September while archery elk hunting and found it to be outstanding. Jacket fit perfect, lightweight, repelled water, didn't snag on brush and kept the chill off. It worked perfect as a second (outer) layer on brisk September mornings. Didn't snag when walking through miles of Salmon berry bushes. This jacket kept me dry on heavy dew and even light rain days. I found if the jacket got wet during heavy rain, the jacket dried quickly. 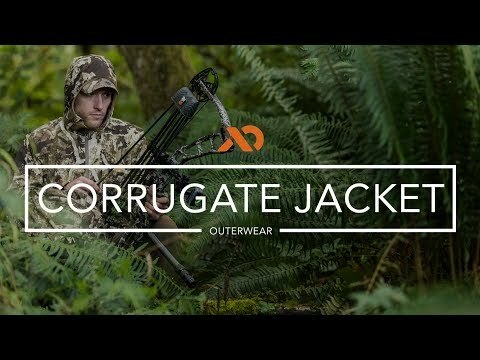 Quality jacket that is perfect for PNW hunting. I purchased this for September hunting in Eastern Oregon and fall hunting in the Willamette Valley. I wanted a lightweight jacket that would offer rudimentary water resistance, cut the wind and allow for layering. The brush busting aspect is nice for the Western Oregon and hunting and it seems like a nice light addition to my pack. The fit is slightly different than my other First Lite gear and in general my only complaint about First Lite is the sizing is not consistent from piece to piece. This jacket is an athletic cut (snug) and the sleeves are almost too long. The sleeves need some sort of velcro or elastic at the end to snug them up and the hood cut is a little weird. The hood works well if you zip the jacket all the way up leaving a little circle for you to peer out of which I think would work well in driving rain or snow but otherwise is a little awkward. The hood is extremely sloppy if the zipper is not all the way up and at that point is somewhat useless unless you have a ball cap on. I would like to see this jacket have a fuller cut like the rest of First Lites products so it works better as a layering piece but if you aren't going to use it that way or only have one layer underneath then it should be ok. I ordered this jacket just in time to get it out on all my hunts this year, I wore it during the cool archery mornings as an outer layer to an assisted layer in the snowy rifle hunts. This jacket fits perfect, is light not only in weight but feel, it is really comfortable and stretchy, it allows total movement with no restrictions. It works great as a wind blocker. I would highly recommend this jacket. The fit is great, a comfortable athletic fit. Not restricting. I bought this for a casual jacket and should be picking one up for hunting soon as well. Since I already had the corrugate guide pants, I knew I loved the 4 way stretch material. I haven't had a chance to wear it much, but its very breathable, and the L fits me like a glove. Its perfect for my size. Get one, you won't regret it. Great outerwear for early/mid season hunts. Used on 10 day back country archery elk hunt in Colorado on spot & stalk as well as mid west whitetail in Minnesota. Lightweight, durable, breathable, able to layer. Athletic tight fit, but still able to layer underneath. Used this during archery in the Sierra. Strong fabric that held up to snags but was also lightweight and breathable. Large was a little loose on me at 6'1'' 180 lbs but that accommodates layering well. Adding this jacket to my kit this year was a game changer. There is a lot of thick brush where I hunt which made much of the mountain unaccessible. This jacket allows me to go anywhere. It works reasonably well as a wind breaker and is mildly water resistant. It does not breathe very well, which on a hot September day can be problematic. But overall I really like it. I can go either M or L with first lite tops which is frustrating sometimes. But in this piece I liked the medium fit. Typically in jackets I find I'm a medium and in shirts I may be a large. I can put this on over my wick and bino harness no problem and the sleeve length is still sufficient. This jacket is a great all around . It, is durable, and blocks wind well. its great for early morning, early season hunts defiantly would buy again. I just got done with a 4 day hunt off the Pacific Coast of California hunting Blacktail and wore this jacket through some nasty brush infested with poison oak and buckthorn. The guide jacket performed beyond my expectations for a lightweight jacket. Lightweight, breathable, and tough I would recommend this jacket as a must for warmer climates where all the prickly stuff wants to poke you. It did get windy and cold due to the marine layer and fog coming in, it also did great at cutting the wind. I paid this jacket with the 150 Wick Hoody and was comfortable. great fit on the body and arms just a little loose in the hood maybe some draw string or elastic would help it keep its form over a hat or face better. Enjoying how quite the material is while hunting. I will add that hiking in and out of Texas brush I was surprise how well this jacket endures all the obstacles. Great lightweight outer shell, cuts the wind and repels light rain exceptionally well. Especially nice to beat some brush and protect those inner warm layers, would recommend for ALL outdoor activities. This jacket is a great all around out peice. Has good stretch, is durable, and the DWR sheds water well. Also blocks wind well. It runs a little large so it you wear it without layers it will feel big. Bought this to wear over my wool pieces to keep them safe. Found out how useful it is, kept the wind from getting to me when sitting and glassing over the kiln 1/4 zip and kept me dry when a crazy mtn storm popped up. The fusion camo is phenomenal. From brisk mornings on the mountain to fly fishing the surf this is my favorite lightweight jacket I've ever worn. This jacket is not designed to keep you warm when it's 20 degrees out or protect you in a monsoon but it does its job well. Perfect for cutting the chilly wind and keeping you dry during a light shower. Very lightweight, comfortable, and durable. I find myself bringing it everywhere I go no matter what I'm doing. I'm on the slim side with long arms so I would like it to be a little more slim fitting around the torso but fits well and leaves me room for layering. Perfect fit. Perfectly cut with range of motion archery hunters demand. I couldn’t ask for a better fit. I have taken this jacket to Ethiopia, Australia and all over the USA. I absolutely LOVE IT!!!! It keeps the rain off of you, keeps you warm without over heating you. It is a must for all outdoorsmen! Protect your wool, if it's dense and brushy or if it's breezy but not cold this Jacket works great with a Wool baselayer, for a breeze mild day, it breathes and sheds some water, a light rain or dew covered brush, save your wool and your rain gear . If you're looking for a lightweight durable jacket that's is surprisingly waterproof look no further. Very comfortable and flexible to wear. Stop wind and will protect you from snow or light rain. Perfect to wear as outer piece to protect your wool. This jacket is the real deal. In the high alpine Colorado mountains it was great. Enough protection working through the brush and thick willows, breathable enough to quickly ascend to the glassing spot and good wind protection while up there. The good fit is really nice too. Very comfortable. I liked how the arms were long enough to comfortably draw and move around and also could hide my hands when just standing. I wanted a lighter jacket for cool August-September mornings and this jacket fits those needs perfect. I love the athletic fit, nothing loose to catch on brush or bow strings. It's light weight, breathable, yet blocks the wind. It'll be a great option for spring/fall fishing as well! This is an outstanding piece of outerwear for areas where the plant life is thorny. It’s nylon fabric also helps shed light rain and dew but is not waterproof. Fits as described in the sizing tables but the sleeves are long. When the clouds come out and wind picks up this jacket is great for blocking wind. Holds up well in light rain and is a great all around jacket for the early season. I love this Jacket. It is not a cold weather jacket, but if the weather is is between 40 and 70, I will have this jacket. It is thin and light weight. It will not do much in the way for keeping up super warm, but it is a great protective layer. It is really great for walking through the brush. I never have to worry about it getting torn up. It is very strong fabric. It is also great for light rain. This jacket does run big. I got a L and the sleeves are way to long. My size falls between a M and an L. If you are on the fence about your size, I say go with the smaller one. the fabric is stretchy, so I should still fit fine. This thing is absolutely badass. If you like the pants you’ll love this jacket. Super tough yet super comfortable, this thing will be with me on every early/mid season hunt this fall. Another amazing piece by FL. The fit and finish on this jacket is amazing fits great all over and has nice pockets. Fits good, the hood elastic is a bit tight and could probably be given a bit more give. Enough to take the chill off. Super lightweight and packable. Haven't tested the water resistance yet. Ideal for the majority of the Arizona hunting season! The excellent pants' twin brother has gotten a warm welcome for me. Although I have not put it to the test in the field yet, I expect the same quality and durability of the pants. Great for early season hunts with a variety of elements. I will use this jacket hunting big game out west, upland hunting in the midwest, for hiking and everyday wear. I sized down to a medium rather than my normal large to adjust for some of the bagginess throughout the mid-section and upper arms. The large fit a little loose through the mid section and upper arms. I could see it getting snagged or in the way a lot. I dont plan to layer much underneath it other than a Klamath hoody and the medium works perfect for that. This jacket fits in great for me. I've found that most softshell type jackets are far too warm in September and not near waterproof enough for later in the year in western Washington. It's a nice water resistant light weight jacket. Lots of stretch. It's not silent by any means but it's not super noisy either. It's quite literally the same as the corrugate guide pant. I wore it just days ago fishing on the cowlitz in a light shower and I came out dry on the other end. It'll be fantastic for cool mornings over your merino. My medium uncompaghre vest fits under it nicely without compressing it. I think it'll be a winner for me anyway I couldn't be happier. If I could give any criticism on the fit it would be the arms are a little long. I ordered a medium and it is fine. Even over a large casual hoody. Firstly, this Jacket is AWESOME! I sorta ordered this on a whim, if anything it would be nice to wear around town. When it arrived my buddy and myself quizzically looked it over speculating on its specific purpose; Not a insulating layer, Not a soft shell, nor rain jacket. After a weekend of throwing flys at hungry backcountry Cutt’s did it find a permanent place in my kit. This sucker is TOUGH! There were multiple times where I would bust through the brush surrounding the lake wincing all the way through; forgetting I’m not wearing my puffy or merino, and appear on the other side unscathed. A few scattered showers rolled through while up in the mountains it cut the wind and knowing it’s not waterproof I was pleasantly surprised on how well it shed water. In conclusion: If you have the guide pants and like how they preform; you will like this jacket. Pair the two up and it’s like wearing a suit of armor. I’m pretty sure it was designed for you boys down south, but I envision it as the best September elk hunting, wing shooting, lady courting jacket on the market. I will definitely be putting it to said tasks this September. I’m 5’ 7” I and 150lbs. First Lite’s fit for me has historically been a little large, so I ordered a small. Fit is just about perfect maybe a tad small in overall length but the sleeves are perfect, and just the right snugness for my liking. Certainly won't replace my rain gear here in Portland, but it's a great lifestyle, backpacking, and hunting jacket. Light rain? No problem. Top notch quality that'll last. Can't wait to put it to the test for this season's deer, elk, and waterfowl. Super material and I like the fit as I can layer under it. Will be used mostly in back country, but nice enough for in town. The generous fir works well for me. I purchased the Guide Jacket with very high expectations and it delivered. Far exceeds the price point. I will rely on it in the early season as well as a protective layer in the late season. Will not hesitate to take on thickets. Great stretch, but a little long in arms and torso. I sized down. Just like the guide pants. Comfortable and durable. Great jacket to take the chill off. Jacket has a nice fit with the body. Arms are comfy with the shooters fit - my arms never feel restricted. Light weight with good durability. Hood fits snug without messing up head movement. bought this jacket for early hunting season and rides in the SxS and i seem to find myself wearing it everyday.. Best outdoor clothing you can buy! So far love the jacket. Great fit. Using as a light outer layer over a T-shirt and when it get colder over top of the Kiln. Great for early season when the temp drops a little bit. I got this jacket for late summer, early fall scouting and hunting here in Northeastern Minnesota. It fits the bill; lightweight, breathes well, fits. Easily could layer a mid-weight chama under it. Looking forward to getting years of use. Good fit, athletic but not too tight. So far, I’ve found the jacket to work in more ways that just a brush beating jacket. It seems to work well to keep that chill off as well. Here in southern Arizona, it seems that it will work well into the later parts of the season as it still maybe 75 in December in some parts. Held up well so far. Down size, I ordered a large and probably should have gone with a medium. The arms seem to run long and there’s a lot of room in the shoulders. You could fit a lot of layers underneath if you run all large. Runs large in the shoulders and arm length comparatively to other large items. Everyone has heard about how great the gear is...AND IT IS!, but I want to express my high praise for the customer service. I cannot express how much I appreciate the attention to detail and speed in which I had my questions answered and order shipped. The folks at First Lite are truly the top of the industry. I look forward to many years of supporting the brand. This jacket fits great. It’s been perfect on these cooler mornings I’ve had to run cameras and I’ve even scouted in it. Recommend for a lighter jacket. This may be the jacket I've been waiting for. As with the Guide Pant, the Jacket is stretchy in all the right places, durable and DWR coated. The Guide Jacket is probably going to accompany me on every hunt and fishing trip regardless of the weather since I can confidently bust brush with it, fend off a light rainstorm and cut the wind a bit while still being able to layer it over everything from just a Llano in the early season to an Uncompahgre when the temps drop way below freezing. Looking forward to really putting this piece to work. The sleeves are a tad on the long side for me, but thankfully the openings have enough elastic to stay in place. I started using the Corrugate guide on early morning hikes over the wick until it gets to warm and i'll shed it. I liked it so much I started wearing it everyday on walks when its a little chilly. I can see this jacket getting a lot of use this fall bird hunting across the midwest. Bought a Large and it fits just right, i can get a few layers underneath when needed but its not to baggy with just a t shirt on. I bought this jacket to help me get into my area quietly and without shredding my merino. For that, this jacket is excellent! I even wore the Corrugate Jacket while hanging stands a few weeks back, and it was a life saver! Got through thorns with no problem and saved my arms form looking like I got in a fight with a cat. Lastly, it rained a bit on us while hanging stands and this jacket helped keep me dry! Love this jacket. It’s lightweight and the dwr coating is amazing. I love the stretch and the shooters cut. It’s perfect mid layer and wind breaker but won’t leave you soaked if you get caught in a little rain. I say I’ll probably buy another one because I think a non camo version will be my daily coat through the fall and winter in the Pacific Northwest! Keep up the great work FirstLite! This jacket stays in my truck, I find myself wearing more and more since I got it with my preorder this year, it’s just enough to cut the wind without adding extra bulk and tough enough that you don’t have to worry about it ripping or tearing if you catch it on a branch. I run extremely hot all the time so this is great as it allows my body to regulate my temp while also blocking the wind and taking away the “bite” it’s my go to over my base layers in the early mornings and late nights. The longer sleeve length is great for tall guys, I can never find something that is cut long enough. Tried it out for the first time this weekend high in the Colorado mountains. Perfect light.jscmet.for the rough terrian. Great breathability and held up perfect. I bought this jacket along with kiln hoody and klamath quarter zip for layering. I just got the jacket and have only really tried it on, and therefore have no field test experience. It is very lightweight but feels durable. I ordered xl in the kiln hoody and also the jacket and found the jacket to a tad on the big side. You can tell a quality piece of gear when you get your hands on it, and this is it. Bought this jacket for early season and so far I can already tell it is going to be my go-to. You can wear it over lightweight layers for warmer days, or layer insulation underneath it. First Lite’s puffy jackets don’t have the most durable outer material, but I can simply put the Corrugate on over it and have all the warmth plus extreme durability. Bombproof outer material. Its everything you love about the Corrugate pants, except up top! Wouldn’t change a thing. Fits nicely. Not too snug but has enough room to layer. Wore this on a SE AK alpine hunt. It was very comfortable to wear. My only two critiques are 1) It would be nice for some type of wrist closure 2) Maybe a armpit zipper vent? I wanted to wear this on the hike up to stay a little dry from going through berry bushes, but felt it was a little warm to do so. This jacket is very light in weight, but is tough as nails. Great outer layer for any hunt. Keeps the wind chill off of you and helps keep you dry. It runs slightly larger in size so be sure to account for when ordering. The flexibility and stretch of the jacket really helps with mobility in bow and bird hunting. Would recommend for early to mid season hunts, after that you'll defiantly need some under layers for warmth. All in all it's an awesome addition. Runs slightly larger in size, specifically in arms and shoulder area. Layered over the llano long sleeve or crew shirt, the jacket kept me warm and dry from the unpredictable weather Alaska has to offers. My go to jacket when hiking, spot and stalking brown bear, and fishing salmon in the Alaska peninsula. Light weight and very comfortable. This is my new go to jacket for anything from bowhunting and mild weather rifle hunting to brush busting while shed hunting or going for a float on the river. This was the best piece of hunting gear I’ve picked up so far. I hunt in thick brush and sometimes blackberries. This jacket will let you push threw some dense brush instead of backtracking. The fabric doesn’t make much noise but it’s not silent. I use this jacket as my go to hunting jacket and love it with the corrugated pants. The sizes run a little big , I usually wear a xl and wear a large in first light . I definitely want my hunting clothes a lot tighter to my body than my day to day clothes. This jacket is fantastic to "lock-in" the power of the 200g+ wool layers. Sheds light rain well for 2-3 hours. Cuts wind well. Put this on over your Kiln Hoody and you will be able to sit through any late season scenario. I got this to go with my guide pants and I feel indistructable marching through tall sage, cheat grass, and other brush. Tough and comfortable just like the pants. I recommend this jacket for everyone! This Jacket is the best all around Jacket I've ever gotten my hands on. The fit is incredibly comfortable and true to size, so if you want to layer with it, size up. This Jacket is perfect for warmer climate hunts where you need something to cover your arms at the minimum, and maybe a little bit of added heat retention. Wearing this in the 80-85 degree mornings of July in Texas it did not significantly increase my perceived heat. As for noise, I've owned lot's of various jackets, from cheap outdoor store multi layers to name brand softshells, and with the exception of a fleece jacket, this thing is as quiet as any of them. This is going to be a fantastic jacket for October bow season in Texas, and will serve well on the hot days throughout winter. The corrugate guide pants have been my favorite article of clothing for the past several years, so when FL came out with a coat made of the same stuff, I was pretty excited. Sure enough, it fits perfect, feels perfect.. its a solid experience. This coat will be seeing a lot of back country hunting. I didn’t think I needed another jacket until I tried this on, and knew the performance and durability was exactly what I needed for archery and early mornings as the weather gets cooler. This jacket paired with the Corrugated guide pants is a sure winner in the backcountry of Colorado, Wyoming, Idaho, and Montana. This will surely be your favorite piece to have in your pack or even your urban go to jacket in the fall and spring, the solid colors are money! Knowing the DWR finish will get you through light rains in the city and mountains! I think this is a specialty brush buster jacket. It is a bit loud with no insulation, but it is a great jacket to put over other fragile feeling pieces to protect them from getting torn in thorny catclaw-like brush. Might be my most used jacket in Texas for this reason. Fits like other First Lite products. I got this jacket not to long ago. Ive taken it fishing on some cooler mornings and it has been great at cutting the wind. I like the fit of the jacket minus the hood. The cut is nice but the hood its self seems a bit large fro the front of my head to the back. The material is awesome and i like the pocket construction. Fix the hood and it gets 5 stars from me. This jacket is perfect for the fall every day. I have been using this for all early morning and late evenings camping/scouting. I like that I can have one light camo jacket to put over anything else to stay hidden during the hunting season, and save my other gear from bushwhack snags. By its self this is a great layer for Utah high/dry country in the cold mornings. There is enough stretch to comfortably fit over my mid-weight puffy jacket without compressing the down. Excited for the temps to drop and put this more to the test! The arms are a little big for me, but then again I don't kayak. So I took the corrugate jacket out and really put it to the test like the pants here in southern arizona, I purposely took it through brush and cat claw and other nasty stuff down here and just like the pants nothing stuck to it and like the description says it is a very nice brush buster. The fit is very comfortable and true to size. The fabric is loud, but it is light, comfortable and one of my go to pieces. Sizing is like most fl gear size down I normally wear xl in everyday cloths and I wear a large in this.